What you find here below was written by Maria Scordialou, Sarah Whiteley and myself when we had five days of intense learning and living together in May ’08 (Axladitsa Guardians Gathering). It gives a beautiful, and rich description of what is asked from us now. Unless we engage our authentic selves, we cannot live the future now. Unless we engage our fullness, we cannot take the leap individually and call in collectively. Unless we tremble collectively, we cannot presence the new. Unless we take a leap together, we cannot access and live the next level of our humanity. Unless we are willing to hold the space open long enough for our collective clarity to emerge, we cannot shift our systems and behaviour for the better. Unless we fuse the streams of practice and inquiry, we cannot see what else is possible and be prepared to meet our chaos. Unless we acknowledge our collective identity, we cannot co-create our real work. Unless we unlearn our complicatedness, we cannot find the simplicity of the next elegant step. Unless we share our new insights immediately, we cannot not serve evolution. Unless we live through our collective identity, we cannot become whole. 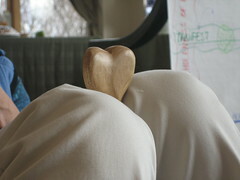 Some had meditated, I had been blogging… As usual, we gathered in circle after breakfast. Taking the talking stone… seemingly totally different voices were heard, which were brought to one picture as someone saw that they were all answers to the same question. Without naming it, we had arrived to the third piece of M’s map: the Thou, the practice. We need the Body, the Heart, the Mind and the Soul!!! We need the complete wisdom, held together by the inquiry. What needs to, longs to emerge through us, for the world? What needs to emerge in me, for the sake of the world, for the sake of Thou? L: I remembered the density of the World and its resistance. But these little orange things could break free. In my despair I was asking myself: What do I do with this world? 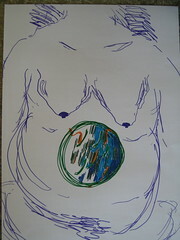 Then this very big Woman appeared in my drawing, very dense herself… The World was in me. That gave hope! A very solid a woman can hold the world! She was equal to the task. If this is the answer to my question… it heals my sense of separation! Living in this paradox: I am the world, and the world is in me; the principle of One connects both if I relinquish myself. Then there is space for the field and what comes through it. If I am not a body; then what is IT that is being expressed? The energetic is so fluid, quickly to move… this re-identification has implications for the field and for the development of the field. The drawing brought it’s own solution and it is possible that it is true: that we are capable of holding the whole universe. We are it, and it is US! The fullness of awareness is not dependent on time or process. The experience of it brings it about. S: My gift is around movement and beauty. The world is doing what it is doing, and I am the tree: expressing, laughing, screaming. The world loves this beauty, this manifestation. It just helps, it supports, it is not a specific solution. Everything is on the tree: love, music, conversations, tragedy, movies, friendship; presence, marriage, beaches, tears… The density, something solid is needed to hold the world. M: Since I was a little girl I had heard the world weep and I didn’t know how to hold her. How to be in the presence of a weeping world that doesn’t overwhelm me, doesn’t consume me? My whole life was about understanding that. I recognise that it takes conversations and a big heart. What radiates out is something that I cannot not. It has made me a little weird… but it gave me the ability to see; things unfold for me. That is why I am good at organisational development and coaching… but it is also a burden. Now I see the bridge, the concept of collective presencing. There are the hearts and the symbols of infinity… the brown lines are the mycellium. When I leave the space, there are others holding it. The We, and what is created through the We is my path. With the We I can fall asleep at night. It is a field of presence that is being held. The mycellium gave me a way… it gives nutrients, and the leaves falling feed the mycellium. If we don’t understand this, the crying of the world is left. Organisations pup up as mushrooms, live, and die when needed, giving their nutrients. This is totally different than reorganisation, aquisition etc. This helps me to see death, and my death, differently. J: I wanted to tap into Source and my question is: How I move with that into the manifest world? This is the challenge of my life. 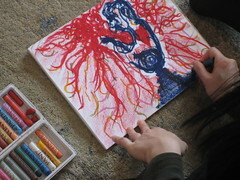 I was drawing many wombs, coming up like in the U process. There is continually evolving, do it over and over, and begin to interact with the manifest. It can come into structure now. It is about continually accessing Source. It is a continually birthing process. M: The world is working with us, it doesn’t have any struggle! The world gives us words like mycellium, it is trying to find us! When something is spoken that makes sense, it starts to blossom; without having to move it uphill. L: They become attractors in a chaos field. In an emergence they form around a next level of develop. S: I had a welcome feeling of the space, and the arc, the fluidity, the gentleness of the surface… I want to dive in that space that you created. It maps about ‘holding space’. I can go in and do so much. The longing itself is a spiritual practice; it is the part of the heart. The longing generates creativity! The longing creates space. R: First came this yellow and then the colors on one side, and next the colors on the other side. Then I put it aside. I had to take it back to add the red dot. 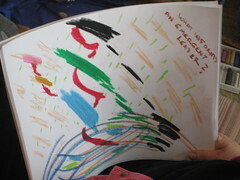 L: The emergent at the very end happened out of the combination of all colors. It doesn’t look like anything else. It takes all my attention. M: It looks like something is planted. Our circle was closing. We cleaned up the room and went to lunch. One last group picture and we left. Our time was rich, good, fertile, promising for the future. and after dinner we ended up in the hot tub…. 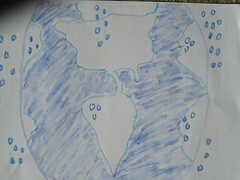 After sensing into the first part of M’s map, the I of the leader, we shifted our attention to the We part of it. This wasn’t as clear as the first part, so this posting might be a little of ‘bits and pieces’… we will see. I remember speaking vividly about the difference of feminine knowing and masculine knowing. It was more a showing than a speaking actually! Masculine knowing is taking a step back (see me stepping away) from the experience, it is talking about something, it is building a concept after the facts… Feminine knowing (not to be confused with women’s knowing! men know this too!) is knowing IN the experience (see me stepping into the center again): while drawing ‘getting something’ you never understood before; while walking in nature ‘getting’ what you need to do next. The knowing IS in the totality of your being, not just in your head; it is as if your cells understood something. We spoke about what Collective Presencing really meant. 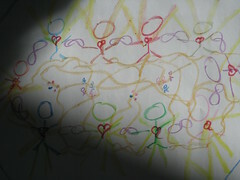 It can only happen in a combination of on the one hand holding together a question or being in collective inquiry and on the other hand a collective holding space, a connection to source or soul. As women we are wired, through our wombs, to bring the Source back into the world. In doing so we, as women, become more whole, but men become more whole too. We are in this way healing across genders. I remember taking M. in the middle of our circle, taking her in a collective hug, where she could ‘get’ – in a feminine, embodied way – that she was welcome in this We. The We is not a headplace, the We can only be experienced. This brought up the entanglement of ‘being intimate in a physical way’ with ‘sexuality’. It is important to make the difference between them. Another entanglement showed up in a constellation that emerged out of the question: What would my womb tell me? How do I/we move from the womb? IThe theme was an entanglement between womb and sexuality, which blurred right relationship with men. There was confusion – held by so many women – : to be a powerful woman, I can’t be sexual, I can’t be attractive to men. In the constellation the woman could take her womb and her sexuality next to her, which made her feel more powerful and complete. “This is my home.” Bringing in the element of the World gave her a larger perspective, much broader than the relationship with the man only. It was inspiring for the man too! 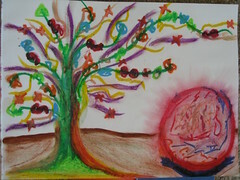 “The relationship with your purpose, freed all my creative energy!” The constellation was complete. The constellation also showed that we, as women, have to step forward with what we know is right to do. We can stop complaining that men don’t do it in the right way; but step forward and say: I/we know something here; at least the next step. Are you willing to come along? What is longing to emerge in the being of leaders now? What is longing to emerge is a new kind of wholeness that hasn’t exited before. A wholeness that can’t be grasped or grabbed by the mind. So the mind has to surrender to something more, something bigger… into a network of knowing on the spot. The being is not identified in identity (or personality), it learns to be identified with the field present and the context it resides in, in the moment. The being of leaders is nothing that is related to personality, it is fluid and it is field-based. What could ‘being a leader’ mean in a biological eco-system? I sensed M. was not connected to our field. Did she need something? Was there something to share? Indeed! 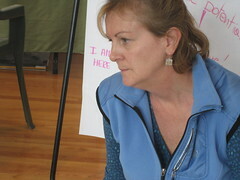 She had been developing a whole map around Emergent or Regenerative Leadership. How is this leadership being formed? She noticed in a gathering with the Pioneers of Change that these young people where doing great work but didn’t have a clue why some people would not understand them. She wanted to check this map with us, not in a mental way, but with all our senses, with our Wholeness of Knowing. 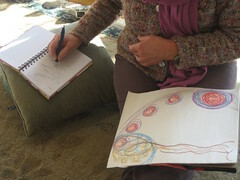 We would use drawing, music, automatic writing, constellation to give her feedback and input from our different perspectives. This was a feminine way of strategic planning! And so much came out of it! We first concentrated on the first bit of her map: the I, the person of the leader. This translated in the question: What is longing to emerge in the being of leaders now? It is heard to tell the depth of insights and the emotions touched by all of us. We became very aware of the difference in paradigm between the young people and the older ones. Sensing into this question and drawing it made clear for L. why she had such a hard time understanding her daughter. She spoke how she could sense the energy going in so much directions, from process to outcome, to process, to outcome, on and on. She sensed a kind of leadership that was willing to step out of the way, ‘willing to go behind’ to let things emerge. And these leaders being in many places, are all working in a similar fashion. But then she realised what was missing! ther is so much passion, but no com-passion, no ‘real’ heart in it, not a humility that mostly comes with age. S. – being the younger generation here – was in awe for what she heard. She totally resonated with L’s words and could add her perspective. She named that in her ‘living all over the place’ she was longing for solid grounding, someone like her dad, who could hold the core while she would do her ten thousand things. Now I understood the real inter-generational issue. This was what I had been longing and expecting to see in the summer in Axladtisa. Now it emerged here in our little circle with so much clarity. We started our Sunday morning, after breakfast and after meditation done by some of us, with a walk. Up and down the road, as the tracks in the forest were way too wet. It amased me throughout the whole day how easily things would flow, how naturally we made transitions from one way of being together to another way. Like M. and I walking down this road, and at a certain moment, not talking about it, not agreeing about it, we just turned and walked back. This is a quality of alignment that is really dear to my heart. As someone said later, Kairos and Chronos come together. 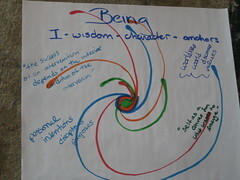 There was wonderment in the circle that you can really be pulled forward by emergence. 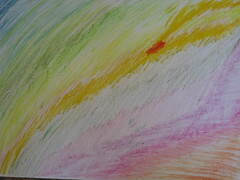 I explained that synchronicity or being aware of the intangible is not emergence. Emergence is a scientific term; it describes that when a new kind of relationship between different ‘wholes’ comes into being, it creates a really new kind of whole that has never exited before. This made us dive deeper into what this Collective Presencing is about. As individuals we all need to be whole, centered, aligned in ourselves. 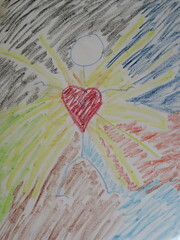 This means to me an alignment, a resonance between our head, our heart and with an open will. When we gather in a circle then, with a shared question or intention, we form a container for Source or Soul to come through. We realised that the five of us gathered here and now, is a unique possibility, this is a unique field that we create, that will never ever happen again! At a certain moment we all shared what was present. 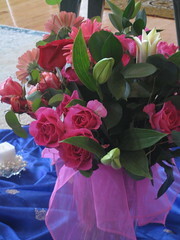 It was crucial for S. in order to feel calm again, to hear from each of us. 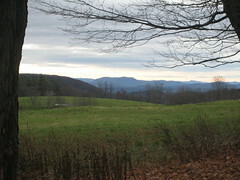 It gave us all a sense of where we were in relation to our shared field. L. realised that this way of being is not about trying to understand what is going on, but a commitment to be present with each other. If we do that the field re-opens again. Being present is like a gift, your presence makes me feel good. And it makes the field tangible. What is then the shared inquiry that we are all present with? but it is not it! Proposing some ideas can be useful, but doing what is needed and right in the moment is different! … some doubt… some resistance… and then she took the leap and stood up. My nature is now and in the moment. It is not about me, but about we. Gratitude stood up and joined the constellation. Collective Presencing stood up too. Emergence said to Collective Presencing: I long for you to stand next to me. Then the World came along. She spoke about needing emergence, but was cought up in ‘being defined’ and having ‘density’. How could she be changed when she is pure form? Isn’t she ‘what is’? Big insight: Emergence is just a matter of standing up and do it! We closed our day with sharing stories. We talked a lot about gratitude, how all the old wisdom traditions have always told how important that is. There is power in Gratitude! It is a practice we need to cultivate. It is Sunday morning now. I am up pretty early, the benefit of the jetlag. I started my day in the hot tub here, watching how the light took over from the night. You don’t see it changing and yet it changes. Like the flowers who are in the center of our circle. We noticed that they were opening and yet you can’t pin it down and say: Now I saw it! This has a lot to do with what was in our focus yesterday: emergence. We started with noticing that at the breakfast table the centered and loving space from the meditation had changed in some heady conversation which left some of us closed down, stressy and agitated. Ego is so eager to take over! To do what it thinks will deserve him/her a place in the circle… but in doing so we loose the essential, that what gives real meaning. Once again we realised the importance of our ability to notice in the moment, to be able to check if we are really present or not. Someone shared a story of a boy giving a taped box to his dad. The dad didn’t understand what was in it. “It is me!” said the boy. If we open our soulboxes, share our love and our thinking, and if we are aware of the links between, the web that it creates, then a New Being has emerged. This is the potential of Collective Presencing. The Circle Being that is in itself a higher level of complexity, a next step in evolution, with the capacity to sense deep into deep and complex situations. Suddenly the right moment was there to share the story of how Women Moving the Edge came into being and what we learned along the way. Next our energies went into the body: someone sleeping, the rest working with sound in the body, which fluently resulted in expression with colors on paper. “I don’t belong at my desk anymore, although I created it myself.” Resonance in the circle around this theme… “What I desire is not created yet.” A lot of talk about the precipice, the gap between what is and what we desire, the difficulty of going there… but is this real? Is it really hard? Or is it fun? is there excitement when we live on this edge? Do you know the aliveness when jumping of the cliff? The sentence changed during the conversation to: What we desire is being created now! Life is here; it doesn’t need to be done! Leaping to lightspeed is not-knowing the form that is being created. But there is intention, there is a guiding question, there is asking what we want. We realised the limits of language, the limits of concepts, the limits of the already known. It is a ‘language +’ that we need. In the emerging we need all channels and there is the possibility to speak right from Source, without words being processed through the mind first. When spoken, these words carry with them the field where they are coming from; you feel the difference. It is this quality that we are seeking also in our acting. Are we able to notice and discern the difference? After a day of preparation with Judy on Thursday we started yesterday afternoon with the fourth gathering called Women Moving the Edge. Subtitle is: of Collective Presencing. 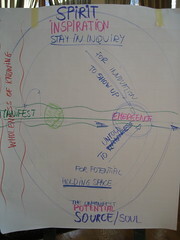 What is preparation for an emergent gathering? It is not about design, because all you can see, all you can know is the first step. It is about building the field between the partners in the hosting team. What does that mean? I notice that I am only satisfied, or have a feeling that the work is done, when we have come to a point of newness, a point where we could raise a new question, a point where we could share a little deeper than ever before. It is about going deeper into what is possible and let unfold the next bit of it, into the manifest. All this is guided by the question: What is next? What is our edge now? So we started with three participants. Actually four, but one lady was distracted by something in her private life which made that she was late, and after dinner decided to go home again. We started in our default way: dancing, moving, doing what was needed to bring yourself present in the room and in the gathering. Then, with the check-in, we plunged right deep into it! Our guiding questions were very simple: What brought you here? and What is your edge now? What a richness in the sharing and in the questions raised! After the check-in Judy and I looked at each other: How did this happen? Do we have anything to do with this??? Asking is setting an intention; is setting up a resonant field where the One – or Source – can come through. It is the intention that activates; and we can be ongoing open to that. The metaphor of the mycelium showed up again: this deeper, highly sensitive and highly connected system of knowing. Is it difficult to love? How do we manifest our future potential? Manifesting from Source is being aware of the connections. Is this hard? Our mycelium is sick; we have to find a way to create a healthy underbelly. Later someone said: not the mycelium is sick, but my ability to engage with it is sick! Being love is a state of relationship without judgment. It is a free flow of energy, with no resistance, no needing to know. The potential for love is always there. We are always connected! Can we put our truth out? Do we dare to tip over the edge? More will follow! You are currently browsing the Seeds for a happy planet blog archives for November, 2008.